Ordinarily, when The Legal Genealogist finds out about a great new opportunity to learn about genealogy, passing it on to readers is the first priority. Still, with all the opportunities I’ve had, I can’t be too selfish so… here goes. The United States Citizenship and Immigration Services (USCIS) Historical Research Branch1 is offering a new series of free webinars covering research in immigration and naturalization records starting this coming week. And it promises to be terrific. There will be four sets of presentations set up to be “an easy and free way to learn about the USCIS History, Library, and Genealogy programs and services from agency historians, librarians, and program representatives.”2 And the webinar series has something for everybody, beginner to advanced. This webinar introduces the USCIS History Library Program and online catalog, and familiarizes attendees with the collection of public historical materials, catalog content and search interface, services for the public, and how/where to get help/more information. General public genealogists (beginner to advanced). 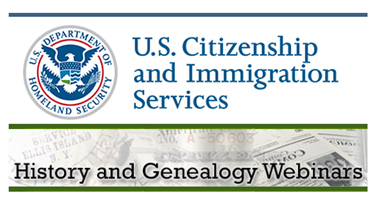 This webinar introduces the USCIS Genealogy Program and familiarizes attendees with the services, fees, website, request processes, and how/where to get help/more information. General public genealogists (beginner to advanced). A bi-monthly webinar delivered by the USCIS Historian covering available historical records, useful finding aids, and procedures for requesting records at the National Archives or from USCIS via FOIA/PA. Occasional webinars in this series may address issues or problems in researching specific historical topics. Scholars and other advanced researchers. A bi-monthly “teaching with documents” webinar presenting selected documents from among those processed by the USCIS Genealogy Program or found among agency records at the National Archives or online. Professional genealogists, genealogical writers and educators. The webinars will be using AT&T Connect — which differs in some respects from the GoToWebinar software you might be more familiar with. So you might want to click over to the “Getting ready for an AT&T Connect Event!” page and make sure your computer is set up well in advance. And — sigh — space is limited. Each webinar can handle 125 people, so if you want in, you’re going to need to get there early. At the webinars page, you can set up a reminder for yourself about the webinar, and it’s that page you should bookmark so you can click through to attend at the right time. And if you can’t make it, well, hey… that leaves a seat open for me, right? It appears that these will not be available for watching at a later date. Is this correct? For the time being, that’s true. I think the USCIS genealogical staff would like them to be recorded but it’s likely that they will need public support for that effort. Making sure every session is full up is a good start!